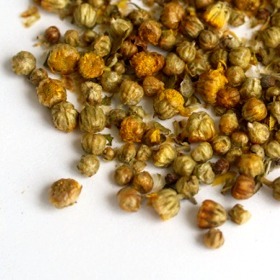 Pearl Chrysanthemum Tea is harvested from small tiny unopened chrysanthemum buds. Pearl Chrysanthemum Tea an unique fragrance and sweet taste. This refreshing Pearl Chrysanthemum Tea helps to maintain good vision and skin complextion. Widely known as a beauty tea to the locals. Bitter tasting at first, the sweetness grows after taking more sips. Is an accquired taste but quite pleasant and minty once one gets used to it. The is the most intense flavoured chrysanthemum tea i have ever tasted but might be too strong for some. If you like standard chrysanthemum tea but want something with more flavour then this is the one for you. When i opened my package of tea the scent of this tea immediately escaped despite the presence of other teas in the package. Very fragrant. Much more intense in flavor than the more common chrysanthemum bud teas. The stronger taste takes a little bit of getting used to initially, but this is a very enjoyable tea that yields many brews.